Along with camping trips, days at the beach, and mowing your lawn, another staple of summer is grilling. Cooking outside with a grill is a great time to socialize with friends and family. Parties are built around a cookout where everyone can enjoy each other’s company. 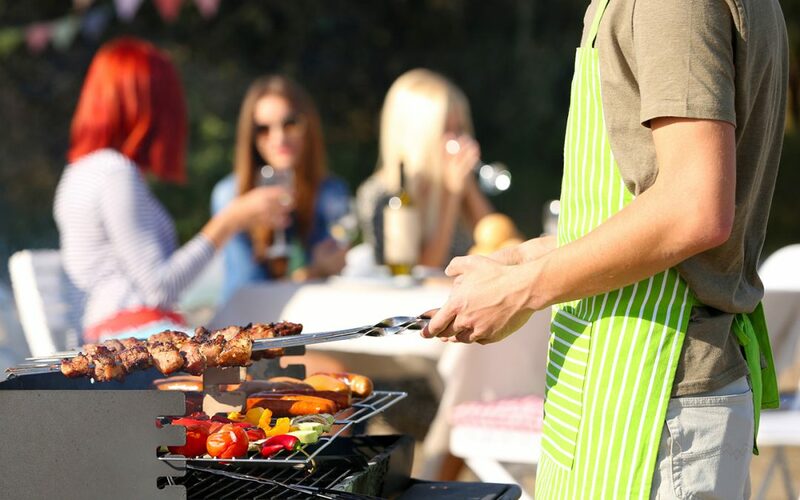 It is the perfect setting for an enjoyable afternoon or evening, but it can also lead to a potentially dangerous accident if you are not grilling safely. Grilling, if not done correctly, can lead to explosions or fire hazards. This can not only endanger someone’s life, it could end up damaging your home or other valuable assets nearby. The Consumer Product Safety Commission reports that over 16,000 people visit the emergency room each year due to not grilling safely. To avoid any accidents, read about these key methods for grilling safely. One of the easiest precautions you can take when grilling safely is to grill in the right place. While it may seem convenient to grill under a covered porch or in your garage, this increases the likelihood of a fire starting. All it takes is one wayward spark to create a dangerous situation. Instead, make sure that you’re grilling at least 10 feet away from your home. You can even create a patio or deck space entirely devoted to grilling and sharing the experience with friends and family. Another important part of grilling safely is making sure that your gas grill and its connections to the propane tank aren’t leaking. Simply turn on the cylinder valve and make a mixture of liquid dish soap and water. Take this mixture and spray it through the connections. If you notice any bubbles, then you know that the connections either need to be tightened or that there is too large of a leak, and they should be replaced. Do not use your grill until it’s secure and safe to do so. This goes hand-in-hand with location. The best way you can start grilling safely is by making sure you’re not distracted and you’ve removed potential threats to the area. When the grill is going, make sure that the surrounding space is children and pet-free so there’s no playing or running in the grill area. Also, if a game of football or another game with airborne objects is happening, make sure it’s played far away from the grill. Too often, a grill fire starts because something knocks it over – this may cause damage to your property and could injure any people nearby. The best practice you can get into is regularly cleaning your grill. Over time, all of the built-up grease and oil from the food can become a fire hazard. While it should just burn off during cooking, too much build-up can be a recipe for disaster. Besides, you don’t want old food cooking against your fresh food! So, in order to keep grilling safely, take a wire-bristled brush and clean the grill before you use it. Make sure all of the residue is removed before you fire it up for a fresh round of grilling. Summer cookouts are a great way to spend time with family and friends. Follow these tips for grilling safely and reduce the chances of anyone getting hurt. Appalachian Inspection Services provides certified home inspections and radon testing to Western North Carolina. Contact us to schedule your inspection.